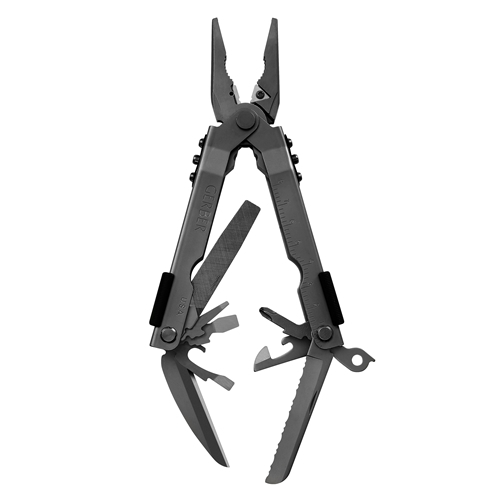 We can think of about 600 reasons why this much-applauded multi-tool belongs on your belt. But don't worry, we'll just stick to the most important ones here. Like profound versatility, for example. And failsafe performance. And a level of rock-solid design and construction that pleases the eye and satisfies the soul. You'd be hard pressed to find a more rugged or more fearless multi-tool out there. But go ahead and look around a bit. See what you think. Then c'mon back to Gerber and pick the Multi-Plier 600 that truly suits your needs. Components: Needlenose pliers, wire cutter, wire crimper, fine edge knife, serrated knife, cross point screwdriver, small, medium and large flat blade screwdrivers, lanyard ring, can opener, bottle opener, file, and ruler.